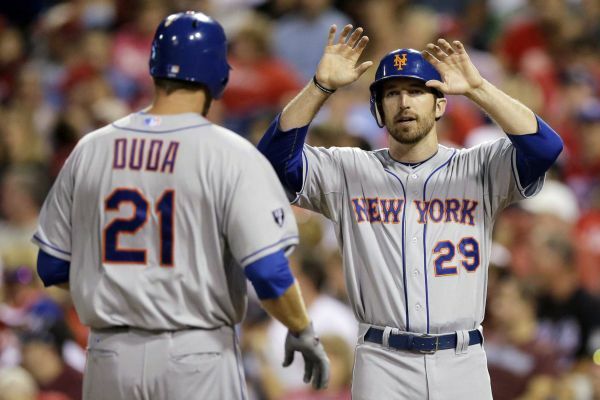 Lucas Duda and Ike Davis have roughly a week to battle it out for the first baseman position. Well it only took until March 21st to happen, but the Mets finally have a first base competition on their hands. With Ike Davis and Lucas Duda each missing significant time this spring, no real answer has been made as to who the starting first baseman will be on opening day. It feels like we have had this exact conversation for the better part of two years now, and frankly, I don’t see it ending anytime soon. Everyday this spring something else popped up and a reason was given why one, or both, of these men weren’t playing. Now that they have both conveniently returned, on the same day mind you, they are giving us the competition we have all been waiting for. Josh Satin appears to have solidified his spot on this roster and might very well have earned a full-time platoon role at first base. I like Satin as a player, I think he is a nice addition to the roster for an entire season, but I don’t know if I want to see him playing every other game. In my opinion, he is best suited as a bench player, filling in at first base and giving David Wright a day off at third as needed, while serving as the right-handed bat off the bench. I think Satin is one of those players that will be exposed if he is given too much playing time, as we have seen all too often with players of his caliber with the Mets. What the front office, Terry Collins and the entire fan base really want is for Ike Davis or Lucas Duda to take this job and run with it. I have always leaned towards Ike Davis in this argument, as we have already seen what his power production can be, hitting 32 homeruns and 90 RBI just two seasons ago. The biggest questions that surround Davis is his mental toughness. He seemed to have a hard time handling the media and the pressure that was being put on him the last two seasons. Once something that like begins, it’s as if the media smells blood in the water. Now you have a target on your back and I don’t know if he is up to handling that if he gets off to yet another slow start. Lucas Duda has always been an interesting case. The man clearly possesses the power to fulfill a corner infield position, but never seems to produce at the expected level. He’s never hit more than 15 homeruns in a season and last year had only 33 RBI, that’s not exactly an ideal HR-RBI ratio. But the front office loves his approach at the plate because he WALKS! That’s great and all, but I want my first baseman driving in runs! I felt like every game I watched last season I would see Duda go down looking at strike three at least once a game. I agree that his patience at the plate could be beneficial, but he HAS to do a better job at picking his spots and swinging the bat more often. I’m done trying to play favorites between these two, whoever performs has my vote of confidence. Truth be told though, and I HATE to say this, but it would not surprise me in the least bit if they both ultimately fail to hold down the position for an entire season. I really hope one of them is able to put a strong hold on first base, I really do, but I’ll believe it when I see it. Enough with the media incidents, no more unsolvable injuries and I will not accept a batting average hovering around .200 anymore, earn your keep. I couldn’t agree more, Terry. Not just these two, but everyone on this team needs to be held accountable for their performance on the field. If they aren’t getting the job done, next man up. If you are really going to prove this team is finally about winning, then no more 3rd and 4th chances for some of these guys, either they perform or you find someone else that will.